Daiso is a international chain of 100 yen shops. Locally, anything found in their store is sold at SGD$2 each. There was a craze that swept the local fountain pen community recently when it was discovered that Daiso carries fountain pen. I remember seeing many “public service announcements” on the community Facebook group informing members which branch has stock of the fountain pen. I picked up two of these pens on a whim. 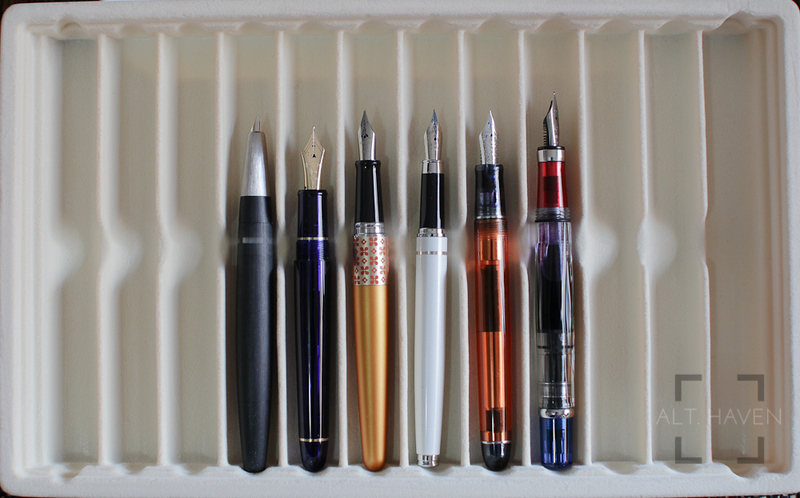 Let’s see how they stack up against other super cheap fountain pens. Spoiler Alert! I don’t like it. The Daiso fountain pen comes in a regular blister pack. It reminds me of how toothbrushes are packaged. Simply rip the packaging apart and retrieve the pen from the rubble. The packaging provides absolutely no protection whatsoever to the pen. My pen comes with its cap slightly bent out of shape, not enough to prevent usage but enough to irk me. The Daiso fountain pen is white with a pearlescent finish accented with silver rings around the barrel and a silver clip. It is a slender pen, slightly on the shorter end of pens that I own but not a pocket pen. It isn’t so slim that I would consider it a skinny pen but it is definitely not a girth-y pen. It is fairly well made. There were no blemishes right out of the pack, other than the dented cap. The finish is well chosen because it wouldn’t pick up nicks and scratches easily. The silver clip is a fairly standard affair, it is rectangular tapering to a narrower point and finally ending with a blob to ease slipping the clip over paper and the like. It is rather tight and stiff but completely serviceable. The cap pops on and off only with a deliberate pull or push, so no worries of the cap coming loose accidentally. The grip is a black plastic that tapers gently towards the nib. It ends with a metal washer just before the nib. The grip is smooth and slightly narrower than I would prefer it. There is a short step between the barrel and grip. It isn’t significant enough to have my fingers complain about it. The Daiso fountain pen takes a standard international cartridge but it doesn’t fit any of my standard international converters. The grip section is just too narrow to fit my Kaweco squeeze converter and my Faber-Castell converter. With a little force, I got the pen to take my Pelikan short international cartridge. If only they made the entire pen just a little wider so that it could fit the converter but as it is the only recourse is to re-use the cartridge as a converter. The stainless steel nib comes in only one size. It writes like a medium and is a rather wet writer. However, it hard starts. Every. Single. Time. You pause between sentences. Once it gets going it is fine and it keeps up fine but it doesn’t take much inactivity before it hard starts again. The nib isn’t particular smooth, it has a very slight feedback in certain directions but for $2 I guess nobody can expect much from the pen. As a $2 fountain pen, the Daiso fountain pen provides a lot of value but I can buy Jinhao 599 that comes with a converter at the same price. Even at such a cheap price, there are better options for a fountain pen. 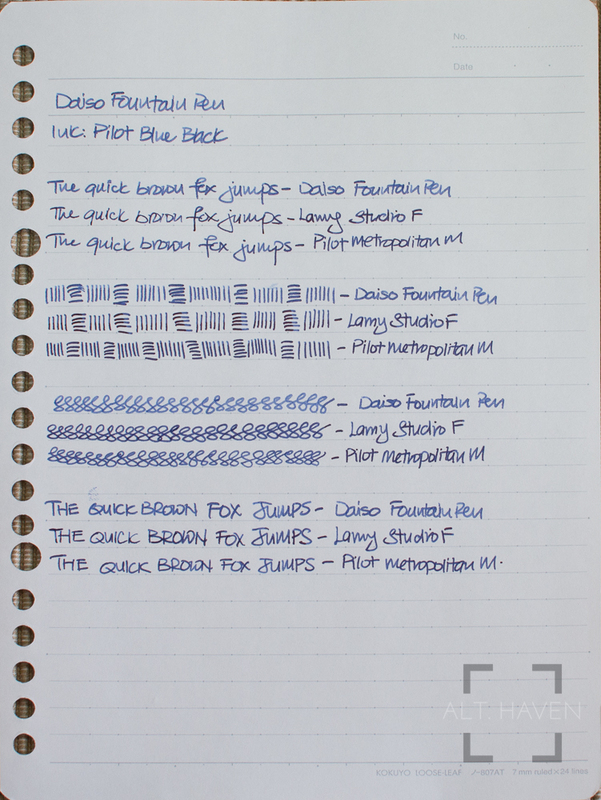 I’d suggest skipping the Daiso fountain pen and get yourself a Jinhao 599 instead. On that note, I am going to announce that I am giving away a white and silver Daiso fountain pen. The silver would be a brand new unopened pack while the white would be the pen that I’ve just reviewed. This giveaway is open to both local and international readers. All you have to do is tell me in the comments below which you would prefer. I would totally understand if nobody wanted the white one. The giveaway ends 1st September 2016.